Need to go to a hospital in the 19th century? So, you're still stuck in the 1800s, huh? And what's that you're saying? You didn't know how to stay on the horse? You fell off? You need to go to the hospital in the city? Hmm, well let's see if that's doable. 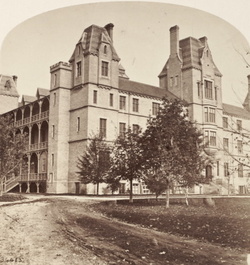 In 1856 the Toronto General Hospital opened its doors on Gerrard Street. You'll be able to recognize it by its five towers above the four storey building. How are you going to get to the hospital? Need an ambulance? 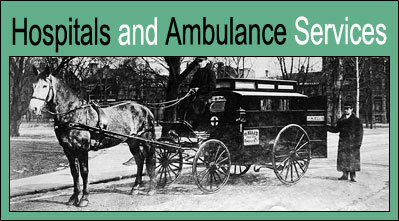 The first known hospital based horse-drawn ambulance service was based out of Ohio in the United States in 1865. These ambulances carried medical equipment such as splints and a stomach pump. In 1867, the year you are currently stuck in, six horse-drawn ambulances are being used right now in London, England, for the purpose of transporting patients with smallpox and fever from their homes to a hospital. These ambulances are designed to resemble private carriages, but have rollers in their floors and large doors that open at the back to easily load patients. The compartment is specially designed to be cleaned easily and disinfected. Anyone with enough money to pay the cost can summon the ambulance by telegram or in person. But, you live in the brand new Dominion of Canada, isn't that right? Well, it won't be until 1880 when the hospital based ambulance service begins in Toronto, with the Toronto General Hospital taking delivery of Canada's first horse-drawn ambulance. In 1889 the first ambulance attendants will be formally trained in Toronto, with the police force ambulance service staff receiving five days of formal training from the St. John Ambulance Brigade. Such training for ambulance attendants is unheard of at this time, outside of the military. As the city grows, so will the ambulance service, improving right along with technology. The early ambulance services were run by the hospitals, but were gradually taken over by entrepreneurs that provided both ambulances for the sick and hearses for the dead. Today, Toronto Paramedic Services is one of the best in the world. Operating from forty-five ambulance stations, the fleet includes 208 vehicles (including 16 mountain bikes) and a staff of 950 paramedics! Anne Augusta Stowe-Cullen was the first woman to earn a medical degree in Canada. She graduated from Victoria College, an affiliate of the University of Toronto, in Cobourg, Ontario in 1883.